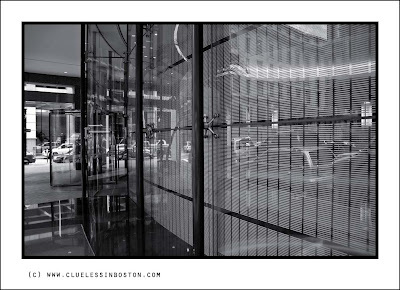 This Monday's monochrome is glass and steel wall of a bank in the Financial District. Other monochromes can be found at Aileni's Home of the Monochrome Maniacs. The glass, reflections, and steel structure work well. The overhang over the walk way has stopped the sun and skylight from blowing out the reflections. Nice one. I am glad they did not come rushing out wanting to know why you were taking pictures. Beautyful game of lines, curves and reflections. That is a great shot. I like the reflections! I host Weekend Reflections so i'm partial to reflections. This is a really cool shot! A really terrific post for your Monday monochrome theme! Wonderful image for a monochrome theme. Plate glass is an intriguing medium. The reflections can be facinating.